Aircraft engineering and design can minimize risks, but this requires protective measures. One hazard, electricity, can influence aircraft functions because aircraft contain devices and equipment for flight, crew and ground support. These maintain communications, navigation and safety, and electrical changes can lead to disruptions. High-quality electricity-related testing can optimize products through reviews and solutions. Conducting electricity has its limits, and the negative impacts of electrical energy can modify other electronics. However, EMI and EMC testing analyze the extent of potential electrical threats to aircraft equipment. The energy currents that pass through electronic systems can propagate electromagnetic radiation, but testing catches these problems and fortifies nearby electronics. Electromagnetic interference (EMI) occurs when external sources discharge energy toward devices. The unwelcome disturbance diminishes or prevents the use of the devices, and it can compromise in-flight stability. In light of the undesirable consequences, EMI testing examines the possible causes and solutions to intervening currents. A variety of sources can produce EMI, and testing replicates these circumstances. The natural impacts of EMI include environmental and thermal stimulants. Solar flares and radiation can send unexpected surges to harm electronics, and electrical storms can also agitate circuits. Signals from human-created machinery, like cellular networks, are more detrimental to electronics. Electromagnetic pulses or transients happen in short surges of energy, which can be an isolated event or a reoccurring series of bursts. Continuous interference is a steady wave of emission. Both types of EMI can alter important device functions at different paces and frequencies. Interference can be radiated — emanated through the air without contact — or conducted — transferred through physical attachments. EMI test software studies each method of interference through bandwidths. Narrowband comes from intentional transmissions and broadband from unintentional ones. The frequency categorizes the emissions so technicians can understand the range and ramifications of their products. After evaluating the conditions and instigators of EMI, it is accompanied by EMC testing. There is usually no specified order for performing EMI and EMC testing, but in aircraft testing, equipment has to pass safety-of flight tests first. As a response to electromagnetic issues like EMI, electromagnetic compatibility (EMC) deals with managing undesirable energy. It’s both a kind of electrical engineering and a designation of equipment. EMC ensures that products avoid interference in electromagnetic environments, and testing measures how well devices react around other devices and elements. Resistance to electrical forces is critical for electronics, and immunity testing monitors whether or not devices can withstand different degrees of electromagnetic pressures. Susceptibility measurements show how vulnerable the products are. Immunity testing can convey how equipment handles voltage dips, like brownouts, surges and interruptions. It can also appraise the way machinery can encounter lightning, magnetic fields, radiated fields and high intensity radiated field (HIRF). Lightning can also have indirect on complex structures, like coupling, and EMC testing can also take these secondary results into account. EMC testing engineers, specializing in prospective electromagnetic dangers, execute a series of trials to ensure products can work alongside fundamental electronic tools used in a range of industries. The aviation and aerospace industries use EMI/EMC testing during manufacturing and installation of larger circuited structures and smaller onboard apparatuses. Aviation vehicles cover commercial and military aircraft, both of which have concentrated structures, use and rules for electronics. Aerospace has similar relevancy but with space-grade purposes. Frequency-generating devices are abundant in aircraft, like radars and radio networks. Maneuvering through weather and observing surrounding changes entails an assortment of data-collecting machinery. Receivers, analog or wireless synthesizers and telemetry are instrumental in safe traveling. They all need to engage seamlessly without expelling or picking up harmful currents. Digital devices are split between two classes — Class A and Class B. Class A is for commercial and industrial application, while Class B is for domestic environments. However, even personal electronics appear onboard, especially in commercial flying. Testing is particularly significant to the airplanes and other airborne crafts because of their proximity to storms and the elements. Their positioning at high altitudes also prompts rigorous inspection so they reach their destination without component failure. Avionic control systems support the orientation of aircraft as they ascend, roll, rotate and land. These movements take special aerodynamic considerations, and the control systems can receive commands from an electronic interface and computing, which opens the possibility of EMI. Aerospace crafts also have EMC requirements, although they add in launch and exploration applications. The Air Force Space and Missile Systems Center’s Standard SMC-S-008 ensures that space projects prioritize EMC and avoid EMI malfunctions. EMC testing for aerospace initiatives includes integrated hardware and systems for airborne and space-directed vehicles. Lightning, HIRF and shielding in transportation are useful to aerospace operations. As the military is a substantial buyer and user of aircraft and avionics equipment, they have specific guidelines for EMC and EMI testing that differ from civilian testing criteria. The Department of Defense (DoD) has developed standards for military aircraft to decrease electrical concerns. The DoD’s MIL-STD-461 outlines the determinations for passable electronics, including aircraft systems and subsystems. The two main categories of testing — mission and susceptibility — are detailed along with parameters and safety margins. MIL-STD-462 is a companion document to MIL-STD-461, clarifying the primary methods for reviewing EMI. Interface and verification practices apply to integral and stand-alone devices, but the better devices for these standards are in compartments smaller than an equipment rack or electrical interconnections with discrete wiring harnesses between enclosures. Also, electrical power input originating from top power sources fit the proprietary codes. Although MIL-STD-461 encompasses other vehicles like ships and submarines, it also focuses on Navy, Air Force and Army aircraft. The standard’s revisions discuss the multiple platforms and uses for electrical components, and so far, revisions cover A through G. Military personnel and contractors who partner with military agencies must observe these updates. General military setup takes two unique approaches for freestanding and fixed or mounted arrangements. Proper spacing and connections ensure integrity in the process. Ground planes can imitate the final organization, and the total layout realistically reflects the military aircraft format. Sufficient military testing procedures start with initiating the measurement equipment and a stabilizing period. Then various signal levels are imposed on the devices with verification techniques. Data scans then bring about injection level information and corrective procedures. Military-grade data presentation plots the results of EMI/EMC testing, and automated processes are the only authorized assembly of testing information. The frequency resolution and amplitude resolution minimums should be represented on the presentation tools to convey these details. Commercial aircraft carry out everyday duties like transporting mail, cargo and passengers. From domestic to international flights, these vehicles serve the public and need rigorous quality assurance. Some private commercial groups abide by military testing, while others cooperate with separate testing practices. However, civilian equipment and aircraft have to adhere to the Federal Communications Commission (FCC) standards. The FCC the U.S. regulating authority on radio transmissions and other EMI-permeable devices. The U.S. Code of Federal Regulations Title 47 holds the descriptions of adequate EMC testing in Parts 15, 18 and 68. FCC Part 15 is the primary statement that establishes commercial standards. This portion explains that unlicensed signals, whether intentional or not, need monitoring, and the subparts detail kinds of radiators, personal communication devices and computing electronics that can impact aircraft. The Federal Aviation Administration (FAA) enforces safety expectations for aircraft, and EMI/EMC testing can simplify certification of airborne vehicles. Their AC 20-190 document indicates the best practices for aircraft electromagnetic compatibility certification. The Radio Technical Commission for Aeronautics (RTCA) has also published standards for the aviation community, especially regarding communication equipment. They collaborate with the FAA to produce policy-cooperative principles. Their documents from several special committees are well-respected in the aviation industry, and these help equipment certification, even in the private sector. Electromagnetic surges are volatile, and they are viable hazards for airliners, jets, gliders, helicopters and additional vehicles. 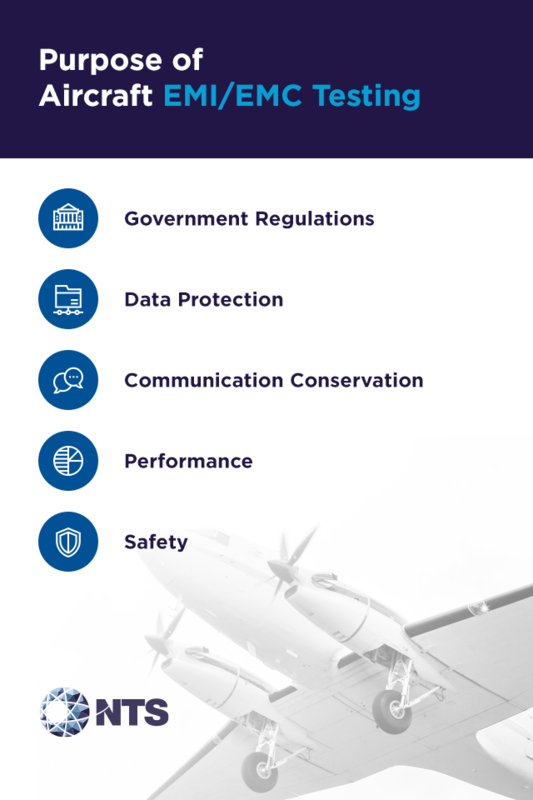 The reasons for extensive aircraft testing consist of authoritative regulations, data protection, communication, performance and safety. Authorities call for compliance of aircraft based on specific standards, but the set of regulations depends on the jurisdiction over the aircraft. There are surveillance measures and reports that can alert the agencies to non-compliant electronics. The accountability from these authorities motivates aircraft manufacturers and users. Enforcement from the DoD and FCC can result in costly penalties. Commercial and military aircraft have applicable fees if EMC testing isn’t carried out. The standards for manufacturing, transportation, use and installation offer clear rules to follow so enterprises can meet government-enforced standards. More than inaccessibility, interruptions can corrupt data and subsequent analytics. Powerful electromagnetic impacts can wipe out information, and the data on aircraft informs pilots on their direction, maintenance status and fuel use. Modern-day jets produce over 30 times the amount of data than the earlier version of wide-bodied jets. Aircraft are enhanced to gather details, yet transforming the information warrants regular, unproblematic activity. Collecting and processing data can advance flight efficiency, but lost or defective information can eliminate these helpful specifics. Approved electronics create accessible and clear lines of communication, which prevents surprises. Pilots and aircraft personnel need to speak with air traffic control to assess ground and air circumstances. Pilots also use intercoms to explain conditions to the crew, passengers and technicians. Brief or sustained breaks in communication can obstruct alternate clearance, introduce military interception for commercial aircraft and increase the workload required to put the vehicle back on track. EMI/EMC trials reduce many of these setbacks to support communication. Electromagnetic surges can jeopardize the accuracy and effectiveness of unguarded devices, which means aircraft devices falter in performance. High speeds and pressure can stress airborne vehicles, so hardware has to remain stable and durable. EMI/EMC testing sustains the quality and execution of systems. The risk of losing equipment early can hinder businesses, military and airlines. Manufacturers can also have their products recalled if they don’t pass testing. Testing prolongs the life of equipment and reduces the replacements and returns for facilities. At high elevations, errors and breaches in equipment can be dangerous to passengers, surrounding aircraft and those on the ground. The individual electronics on airborne vehicles can contribute to electrical phenomena and ineffective protection. Intact telemetry manages the vibrations and strain planes or helicopters experience, and if these aren’t running, the state of the aircraft can be uncertain, leading to complications. Telemetry is just one aspect of functional aviation safety, and testing for EMI/EMC can reduce the threats. Depending on the purpose and facility in charge of the aircraft, EMI/EMC testing happens during different stages of development and manufacturing. Initial testing for pre-compliance can prepare equipment to pass the assessment later on, and it saves time in the long run. The test site for aircraft can be an open area test site (OATS) or a reverberation chamber. OATS are ideal for larger electrical components, and aviation and aerospace both have a history of using these spacious setups. Reverberation chambers, including semi-anechoic chambers, reproduce a reasonable equivalent to aircraft compartments. These cavities are formed with conductive walls and electromagnetic field stirrers. Stirrers progress through the intervals of frequencies for testing. The enclosed metal rooms are preferred for constructing the right situations to observe compatibility between devices. Test plans frame the entire testing process by listing each intended test, the equipment, the setup, the methods and the basis for failure. Engineers, developers and technicians work together to contrive test plans for a well-rounded program. Despite the material and guidance available for EMI/EMC compliance, equipment fails testing and certification. Failures can happen because of poor design, inadequate attention to detail, non-compliant auxiliary devices and a barrage of standards. Installing an increasing amount of equipment in compact areas means the likelihood of interference is greater than ever. Upholding EMC while the proximity is high and the spacing is low is a prevalent issue in cockpits and other enclosed compartments. Aircraft systems have to juggle the swell of frequencies, which complicates EMI/EMC testing. Design problems can also detain certification. Mediocre auxiliary electronics like USB drives and minor devices can affect emissions testing when they are plugged into avionic equipment. These secondary devices also need to satisfy regulatory standards. To avoid distorted measurements, any possible attachments and additional devices should undergo inspection. While government agencies oversee commercial and military production, voluntary agencies offer additional recommendations. These respected groups and committees offer plenty of valid specifications and techniques for testing. The Institute of Electrical and Electronics Engineers (IEEE), the American Society for Testing and Materials (ASTM) and the American National Standards Institute (ANSI) are some of the leading voluntary groups, but the different recommendations can challenge the industry as a whole. Unifying standards and methods can improve overall EMI/EMC testing procedures. Those who do business with other countries also can run into trouble from a lack of mutual recognition agreements. Nonexistent international standards can make nation-to-nation interactions time-intensive. As the industry evolves, emerging trends propel testing and certification forward. Popular and experimental practices in EMI/EMC testing can develop more coherent aircraft systems and reduce dangers, so it’s beneficial to track them. However, these trends are rising and putting forward alternatives to traditional testing. Aircraft typically have an enclosed infrastructure with cables and wires to convey information to personnel on the ground. However, wireless capabilities are increasing and changing electronic communication. In addition to wireless voice communication, data transfers over wireless networks supply pilots with further knowledge for navigating. However, wireless technology in aircraft shifts the testing procedures and places more data-heavy devices onboard. Machine intelligence is also entering avionics, so technology has more complexity and density to account for in testing. Internet of Things (IoT) devices have higher frequencies on top of their intricacy, and by definition, they call for connectivity and an assortment of electronics with high compatibility. EMC simulation is another rising trend that can detect preliminary design problems. The decision-making process for electronics can speed up, and it can streamline testing by requiring fewer tweaks and repeated tests. This can elevate equipment safety and innovation for the industry when the development cycle is run through digitally. Stricter limits and new regulations, specifically in military standards, are forcing EMI/EMC testing to become more meticulous. The margins of error are shrinking with recent revisions to MIL-STD-461, which means manufacturers, laboratories and engineers have to be exact in their observations and calculations to pass. EMI/EMC testing currently is forging ahead in the diligent evaluation of electronics. Professionals are discovering more ways to safeguard aircraft and deliver safe components. The future of electromagnetic trials include faster processing concerns, automation, push for pre-compliance and shortened design cycles. As technology becomes indispensable to many industries, the capacity of devices gets more impressive. Processing power is set to expand for devices, so tests can expect new processing speeds and different voltage levels. Rapid computing in more electronics can generate unfamiliar frequencies. Fewer manual electronics and more automation can also come up in future aircraft. Automation can employ consistent electronic patterns, but it will likely advance EMI/EMC testing. Pre-compliance testing is also spreading, and proactive assessments can lead to fewer failures. Early testing can sharpen practices for manufacturers and testing laboratories. The length of cycles for production and design may drop in the coming years because the market appears to be more competitive. Shortened production cycles can cut down on testing time, and it may leave companies with a better return on investment and higher productivity. Commercial and military operations value efficiency and early organization can ease some of the testing workloads. With passion, expertise and precision, NTS goes beyond compliance to create safer and more efficient products. As the largest test laboratory network in North America, we are an established partner for engineers, developers and manufacturers. Our testing solutions mitigate hazards to aviation, aerospace and many other industries. Our seasoned EMI/EMC testing engineers, technicians and specialists offer aircraft-specific testing to fortify air travel and protect all those present from electrical risks. Through design practices, control materials and verification, NTS examines the range of electrical challenges to airborne vehicles and equipment. The DoD and commercial enterprises have relied on NTS for years, and we tailor our plans to our partners’ purposes. Our daily pursuit of success translates to our partners. You can receive fine-tuned results when you entrust NTS with your EMI/EMC testing. For additional information about aircraft testing, talk to an expert today. Alternatively, you can request a quote to learn about our pricing and services.